Epithelium: Thyroid gland. Atlas of Plant and Animal Histology. The image is from thyroid gland. Technique: 8 μm paraffin section stained with PAS-haematoxylin. 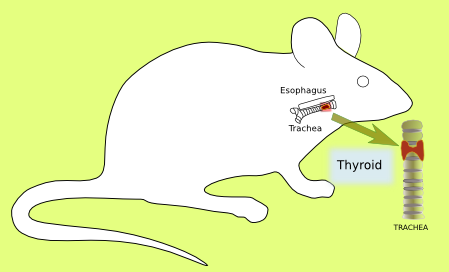 Thyroid, one of the largest endocrine glands of the body, is located towards the front of the neck, above the Adams apple. It has a butterfly shape and it is divided in lobes, which are separated from each other by connective tissue. The blood vessels, where the hormones are released, run through this connective tissue. Thyroid lobes are composed of rounded follicles. Each follicle contains an acellular lumen surrounded by a simple columnar/cuboidal epithelium. The internal space is filled with colloid, a proteinaceous reservoir of thyroid hormone precursors, the most abundant one is thyroglobulin. 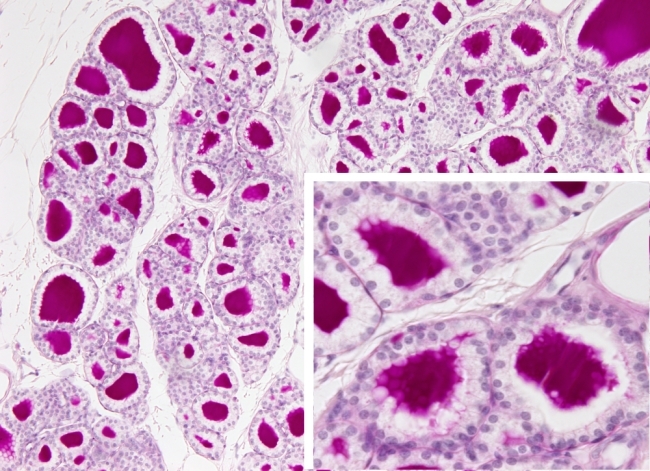 The simple columnar/cuboidal epithelium is formed by follicular cells, which synthesize and released two hormones: triiodothyronine (T3) and thyroxine (T4). Parafollicular cells are found among the follicles and release the calcitonin hormone.